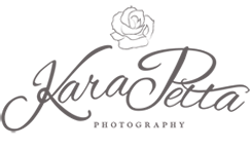 Kara Petta Photography offers affordable packages for any occasion. I provide professional photography services ithat include: wedding, portrait, graduation, family, children or just to celebrate a sunny day. Professional photography is a great and lasting investment that will be cherished for years to come. Call to set up your session today! Session fees start at $100. Sessions include my time, creativaty, an in-home or in-studio style and inspiration consultation, acess to a whole barn full of props, custom editing, online gallery, and a post-session consultation. Each collection includes a style and inspiration consultation, custom editing and touch-up, online gallery to share, facebook images to share, and a post-session consultaion. All five packages include an engagement session, online gallery and a fine art box of printed proofs. Each package has the option of customizing with an la carte menu to fit into any budget. I only book a small number of weddings each year so that I can maintain a close relationship with my clients. This also allows me to best serve each client and give the individual attention that is required. Please inquire to see if your date is available. Please contact me to set up a consultation or for more information.